Those who enjoy a tough and unpredictable scrapper that works the dark corners of the world for gain through intimidation will find the Brigand to their liking. He serves his group best as an unseen element in the chaos of battle, positioning himself just behind the frontlines and dealing powerful strikes of opportunity against the enemy. 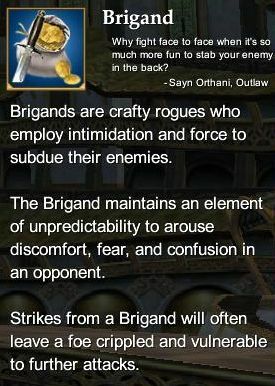 Brigand Epic Weapon Series (80) - Rise of Kunark Brigand epic weapon. This page last modified 2011-08-25 22:52:37.